Democratic Party leaders gathered at the Little Rock AME Zion Church in Charlotte on Saturday to elect the newest state senator: Jeff Jackson. Jackson will replace Dan Clodfelter, who resigned from his state senate seat on April 8 to become mayor of Charlotte. Jeff Jackson was elected as state senator for North Carolina District 37 by Democratic Party leaders who live in the district. Jackson will replace Dan Clodfelter, who resigned on April 8 to become mayor of Charlotte. Forty-nine Democratic Party precinct leaders who live in state senate District 37 folded up scraps of paper in a process that took just over an hour. Charlotte mayor Dan Clodfelter also had a vote but did not participate. There were four candidates running for the senate seat left vacant by Clodfelter. The top three vote-getters in the first round made it to the second round. Gaston county assistant district attorney Jeff Jackson got 25 votes -- more than the half he needed in order to win the seat. "We felt confident going in that it was going to be a very close race, and it wound up being a very close race,” Jackson says. Right behind him was former Charlotte city councilman Billy Maddalon with 21 votes and former Charlotte Mecklenburg School board member Amelia Stinson-Wesley who received four votes. Maddalon says he believes Jackson had an advantage, because until a few weeks ago he served as third vice-chair of the Mecklenburg County Democratic Party. He says Jackson had the relationships with the party officials who voted. "That's just old-school get-in-early, get 'em-to-commit-to-you, give-you-their-word and make-it-difficult-for 'em-to-commit-to-anyone-else kind of politics," Jackson says. "It's not dirty at all. It's unfortunate, because for those of us who agreed to get into the race, I don't think we had any idea that we were so far behind the eight-ball. By the time you get in, you sort of need to fight like a you-know-what to win it and that’s what we did." Jackson says his four priorities are raising teacher pay, requiring private insurance companies cover autism, helping build the solar industry and making it easier for first-time offenders with low-level criminal convictions to clear their records. His first day in office will be May 14. 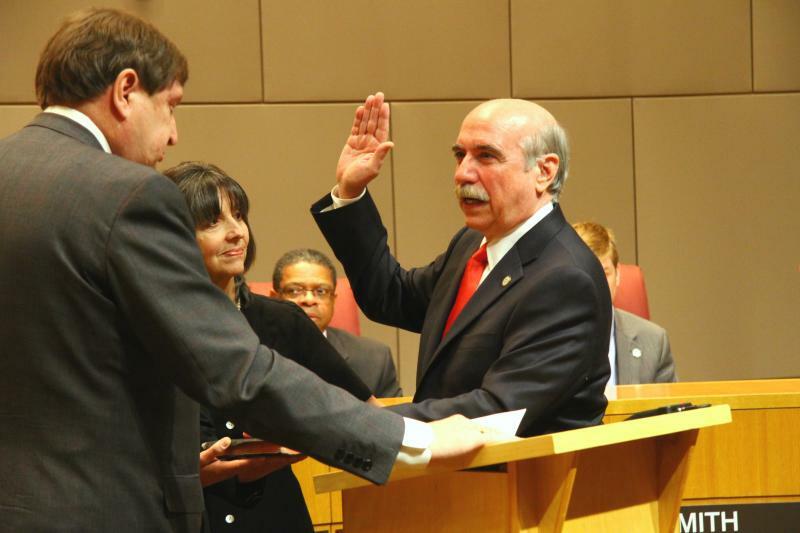 Wednesday, Dan Clodfelter was sworn in as Mayor of Charlotte. There was the pledge of allegiance, an oath of office and prayer…more or less the standard affair. Of course how Clodfelter became mayor was anything but. WFAE's Tom Bullock sat down with Charlotte's new mayor just after the ceremony. When Dan Clodfelter was appointed mayor of Charlotte last month, he resigned from his position as state senator. This Saturday, 50 Democratic Party officials will decide who will fill his seat. There are four candidates in the running: assistant district attorney Jeff Jackson, former Charlotte Mecklenburg School board member Amelia Stinson-Wesley, former Charlotte city council member Billy Maddalon and east Charlotte activist Darrell Bonapart. They all participated in a public forum Tuesday night at the Asian Library near uptown.